Application of superposition method for simple electric circuit. Electric circuit is built from one voltage source and one current source. Main circuit will be divided into two sub-circuits because there are two sources. In the first sub-circuit current source will be the only extortion. In the second sub-circuit voltage source will be the only extortion. 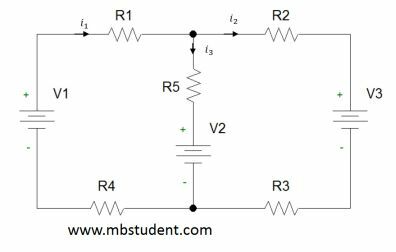 Application of superposition method to electric circuit which is built from three voltage sources. Because there are three extortions in the circuit, therefore, main circuit will be divided to three sub-circuits.